Here is a collection of syllabi and assignments that we have used over the past several years in online writing instruction. We feel these can help you get a better understanding of what teaching online entails as far as scheduling and assignment management. Do you have an idea, assignment, or syllabus you want to share to be featured on this page? ​Please check out the Connect page for more information on how to share your ideas. 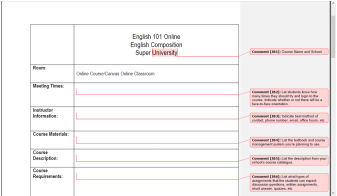 Creating a clear course syllabus is important in the online writing classroom because it is the rule book for the course. Using some visual interest like boxes or tables to visually divide out the information can be helpful and allow students to scan the document to find an answer to a question they might have quickly. This is an example from one of my first-year writing courses. I use this template for all of my online writing courses, but alter the content to fit the school and course goals. Having a clear syllabus supports the PARS philosophy by making class policies Accessible to the students while supporting the the Strategic nature of course design. Some courses are taught during the summer within a compressed timeframe. This is where we get the famous teaching line: "Half the amount of time and twice the amount of work." As a result, it is important to be very strait forward with students and expectations, as well as be Strategic in design and delivery. To get started, here is a sample syllabus for my online 6 week writing course. The syllabus includes all course and program policies along with grading information, suggested support links, and the schedule (which I also embed within the CMS for accessibility reasons). During my face-to-face classes I would normally just go through the syllabus with the class on the first day, but as this is online, I make a video of me walking through the finer points of the syllabus so students will have the paper version and a video explanation. This makes the first part of the class more Personal. Using multiple modes to communicate and being Responsive in communication with students can increase the chances of students retaining the information and also reduce questions that can easily be answered by reading the syllabus and watching/listening to the video. Below, I have created a brief video that discusses how and why I use video screen capture to discuss the syllabus, assignments, schedule, and peer review. This is a research paper assignment that I have had a lot of success with in my online English Composition classes. In teaching for many years, I started to notice that students don't know a lot about the field that they have decided to enter, so doing a research paper on their field of study/degree proves to be helpful. This particular assignment sequence has them look at how technology has played a role in their field of study and how it has influenced the trajectory of that field. Students begin with picking a topic and this is done in a discussion thread, so all of the students in the course get to see the topic choices of their peers. Once they all have a topic, they create an annotated bibliography. Then they complete a detailed outline. After they complete the outline, they submit a rough draft to the discussion boards and we do a peer review session. Then they polish their rough drafts and submit the final research paper. I feel like this assignment sequence supports the PARS philosophy because in discussing topics in the public discussion forum, I'm both Accessible and Responsive to the students, helping them to brainstorm and decided on a specific angle to take for their papers. Further, by doing a research paper on their field of study, the definition of Personal gets extended to the students; their learning becomes personal to them because it's focused on their future career. Discussion threads are incredibly important in the online writing classroom. They are a great way to be Personal, Accessible, and Responsive to students. Some classes have discussions every week, some have them every other week. I set up my OWCs to have discussions every other week and the weeks we don't have discussions, the students work on their bigger writing assignments. I call these "discussion weeks" and "work weeks". There are also several ways instructors can setup the due dates for discussions. Traditionally, there is a due date for answering/responding to the discussion prompt and a separate due date for responding to peers and instructor follow up questions. The due dates I use are Wednesday by 11:59 p.m. for responding to the discussion prompt, and Saturday by 11:59 p.m. for responding to peers and instructor follow up questions. A lot of online instructors are also very Strategic when participating in discussions. Some will post a prompt, and then an initial post that breaks down the prompt, a mid-week post, which usually takes the discussion in another direction, and a final or closing post, which summarizes key takeaways from the discussion for students. There are many ways that instructors can use the discussions to create a more collaborative learning environment. Sometimes, I use them to post topic choices for papers, other times I use them to discuss assigned readings, or peer reviews. Using discussions helps instructors engage with their students because it's one of the main places that student/instructor interaction takes place. To the left is a document of some discussion prompts that I use a lot because they've proven to yield really good discussion responses and a great interactive class discussion during the week. The copyright to these instructional materials belongs to their authors, Jessie Borgman and Casey McArdle. However, they are licensed under a Creative Commons Attribution-NonCommercial 4.0 International License. This means you are free to copy and redistribute them in any medium or format and to remix, transform, and build upon the material, as long as you provide proper attribution to the author. Commercial use of this content is prohibited.